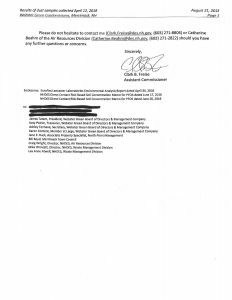 NHDES representatives sampled a gray soot-like substance accumulating on exterior window sills and thresholds of the Webster Green Condominiums in Merrimack, NH on April 12, 2018. 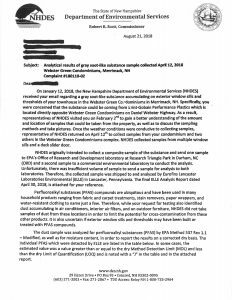 Analytical results of the sample show PFAS compounds detected in the sample as shown in this letter and lab report. NHDES has not developed a guidance level for PFAS in dust. However, although not directly comparable, NHDES has developed direct contact risk-based (DCRB) soil screening levels of 500 nanograms/gram (ng/g) each for two of these compounds, PFOA and PFOS. 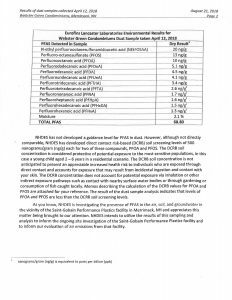 The result of the dust sample analysis indicates that levels of PFOA and PFOS are less than the DCRB soil screening levels. NHDES intends to utilize the results of this sampling and analysis to inform the ongoing site investigation of the Saint-Gobain Performance Plastics facility and to inform our evaluation of air emissions from that facility.